In our youth, the subculture known as hippies was all the rage. The hippy subculture grew out of the beatnik movement of the 1950s, morphing from Jack Kerouac motivated beret wearing youth sporting dark sunglasses and beating on bongos, to long haired, peace loving, tie-dyed clad rockers who practiced free love, lived in communes and attended Woodstock. The hippies fell out of favor in the 1970s during our youth replaced by young Disco lovers and hard-core rockers with long hair and the love of plant smoking. For the record, Disco was never our thing. Today we have the hipsters; man bun, skinny jean wearing youngsters with big eyeglasses and fedoras who get their flavored coffee from behind a counter and look down their noses at anything in the mainstream. To those of us over 40 they are nothing more than an annoying part of the landscape, made even more annoying perhaps as we realize we too were once annoying in our own subculture, during a youth that has now slipped away from us. There are other subcultures of course, some not reserved for the youth. 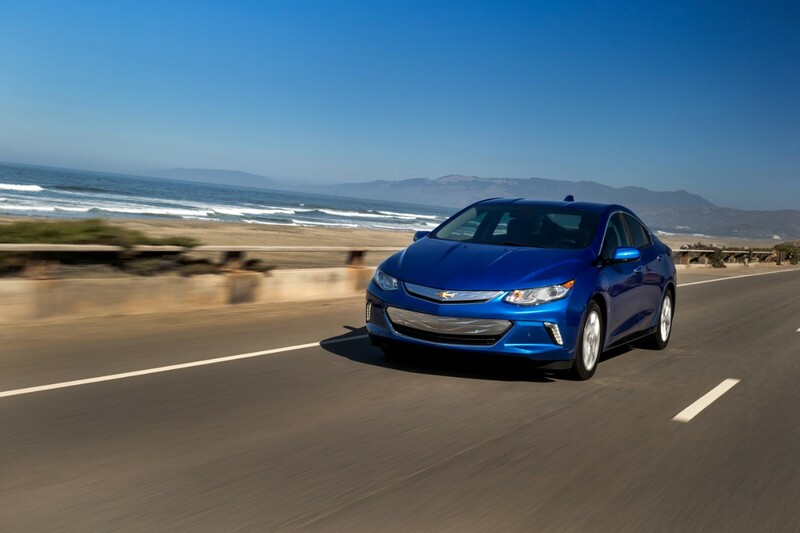 We discovered one this past week when given a few days to test the new 2016 Chevy Volt. 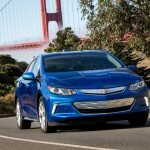 The Volt is different from the hybrids we’ve driven in the past. 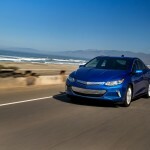 A hybrid vehicle uses a combination of a conventional gasoline and electric motor to move on down the road. 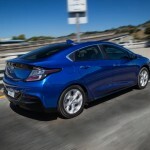 The plug-in hybrid, which is what the Volt is, relies on battery power until that has been depleted then the gas motor fires up providing a recharge. 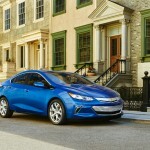 Chevy introduced the Volt to the world in 2010. The first model looked like something that escaped from a Tron movie. The first glance made one think that the 1980s vision of what a tech world would look like 20 years hence had come to fruition. The squat looking compact was sluggish on the road with an interior that was so futuristic, it looked outdated. Sure, 40 miles on a full charge was great, but the fuel tank was pressurized meaning that one had to depressurize the fuel filler before gassing up, among other minor annoyances. The gas engine also had a heavy iron block, didn’t use direct injection and needed premium gas. 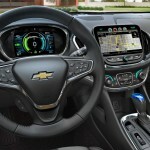 The new dash looks modern without going too far in the future with electronic gauges that are configurable,topped off by an 8-inch touch screen in the center stack featuring Chevy’s MyLink system. 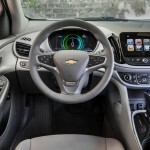 The Volt is offered in two trims, the base LT starting at $33,995 and Premier ($38,345), our tester, which features such niceties as leather seats, Bose stereo, and heated front and rear seats. For 2016, also a standard rear-vision camera, and active safety options that include Lane Keep Assist with Lane Departure Warning, Side Blind Zone Alert with Lane Change Alert, Rear Cross Traffic Alert, and Forward Collision Alert with following distance indicator, front automatic braking, and advanced park assist with front and rear park assist (semi-automatic parallel parking). 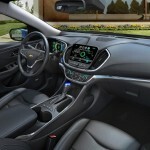 Most of the changes for the Volt however have come under the hood. 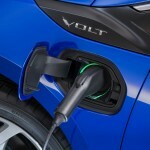 For 2016 the Volt gets a new two-motor drive unit that GM says is up to 12 percent more efficient and 100 pounds lighter than the first-generation drive unit. Battery capacity has also increased to 18.4 kWh using 192 cells rather than the 288 in the first generation with a weight reduction of more than 20 pounds. The 1.4-liter gas engine has also been updated to a 1.5 liter that uses regular gas, delivers up to 42 mpg with direct-injection, and an aluminum-block. Also new, and something that was curious to us at first is a “Regen on Demand” feature. Before we knew what it was, the single paddle behind the steering wheel had us wondering. Then we learned what it was; the “Regen on Demand” feature, a way to control energy regeneration beyond the traditional use of the brake pedal. Also new for this year is a 120V portable cord set with a simpler, compact design with more convenient storage location. There is also a new feature that uses GPS location-based services that optimize battery charging. If you set it for your home location for example, you can have it charge when utility rates are at lower, off-peak times. 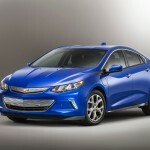 On the road the Volt drives as well as any other car in its class with a fully gas powered engine under the hood. We never really noticed, beyond the breaking caused when we used the paddle, anything different. We were also struck by the notion that if this were a fully gasoline powered compact, it would be a fine vehicle. 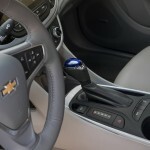 That it can avoid the driver having to visit a gas pump throughout the course of your normal life on a regular basis, is just icing on the cake. Speaking of icing; we never had the chance to fully charge our Volt but did investigate how we would do so away from our house. 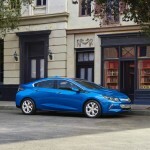 GM says on a full charge the Volt will all electric for up to 53 miles, more than most commuters will drive in a day. You can charge it through your household electric overnight, but what if you needed a charge on the road. Upon a bit of investigation we found a whole subculture, one belonging to the increasing group of electric vehicle owners. 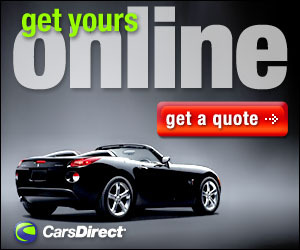 There are Internet sites that show the location of charging stations throughout your area, commercial and free. We used PlugShare.com, and found where to charge up around town if needed. Each location on the site has user provided photos and comments. It was on PlugShare.com that we learned of a free public station near our office, and what the meaning of what it is to get “ICE’d”. There are comments on each station location like “still broken and blocked by ICEs” or “always seems like the spots are clear of ice and haven’t seen anyone charging here either”, and “There is a GE Charging Station at this location with two J1772 connectors.” We learned that ICE stands for Internal Combustion Engine, and getting ICE’d refers to a non-electric vehicle that parks in a spot that prevents an EV from being able to use the charger. Cruses to those who practice Icing, we guess. The EV subculture, as we now call it, doesn’t bang bongos, all grow their hair long, or wear tie-dyed t-shirts, although we suspect some may still get flavored coffee from behind a counter. What owners of EVs do is live a motoring life almost free of visits to a gas station. Sure, there is a cost to charge up, but it’s still much less than what it would be to fill up at the pump every week. After a few days with the Volt we could easily see ourselves as part of this emerging EV subculture. 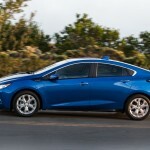 If the new 2016 Chevy Volt is what is required to join, then it certainly won’t be too hard to convince someone to sign up.